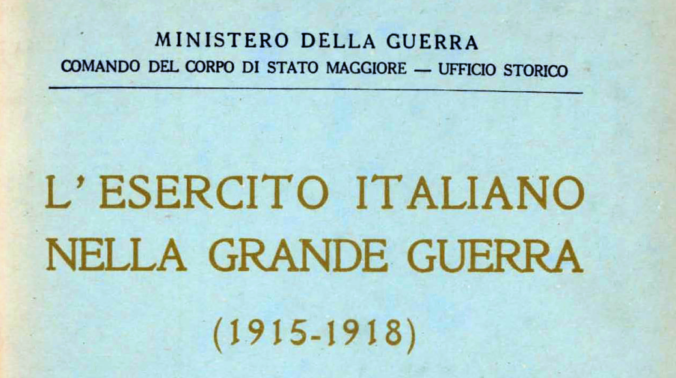 Part of the Cover of Italy's official history of World War I, "L'Esercito Italiano nella Grande Guerra 1915-1918" ("The Italian Army in the Great War 1915-1918"). The Italian Army published its official history between 1927 and 1988 – interrupted by the Second World War – under the title of “L’Esercito Italiano nella Grande Guerra 1915-1918” (“The Italian Army in the Great War 1915-1918”). The history stretches over seven volumes divided into 37 books and is accompanied by panoramic sketches, topographical maps and task orders, comprising about 17,000 pages. Of particular interest to researchers and scholars is a synthesis of combat unit diaries written during the war. The first four volumes are availabe at the Italian Ministry of Defense’s website, unfortunately only as a page viewer and not as a PDF. Additionally, these days, most of the time the Server which hosts the book images is mostly offline. However, we’ll keep the links here for reference. Volume V: The war in 1918. Volume VII: Operations outside the national territory: Albania, Macedonia and the Middle East.